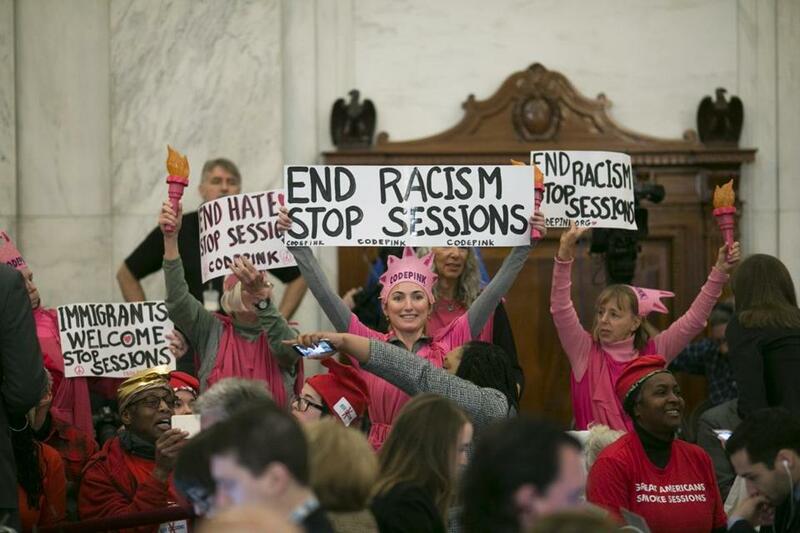 Women affiliated with Code Pink protested during a confirmation hearing for Jeff Sessions on Capitol Hill in January. Desiree Fairooz (at center behind sign) was convicted of disorderly conduct and demonstrating on Capitol grounds. NEW YORK — A jury Wednesday convicted a Virginia woman who was charged with disrupting the confirmation hearing of Jeff Sessions as attorney general after she laughed during the proceeding. The woman, Desiree A. Fairooz, an activist with the group Code Pink, was found guilty of the two charges she faced: disorderly conduct and parading or demonstrating on Capitol grounds. The jury also convicted two other activists in the group she was with, Tighe Barry and Lenny Bianchi, who were dressed as Ku Klux Klan members with white hoods and robes and stood up before the Jan. 10 hearing started. They were acquitted on a count of disorderly conduct but were convicted on two separate charges of parading or demonstrating, Barry said. The verdicts were returned shortly after noon Wednesday. A two-day trial in US Superior Court in Washington ended Tuesday. All three face up to 12 months in prison. Fairooz, 61, of Bluemont, Va., said she was “really disappointed.” She said her lawyer, Samuel A. Bogash, would file post-trial motions seeking to set the verdict aside. She said it was too early to discuss an appeal. “We’ll face that music when we get to that,” Fairooz said. She added that she would continue to protest. “I’m so disgusted with so many different aspects of our current government,” she said. A spokesman for the US Attorney’s Office in Washington did not immediately return a call and e-mail seeking comment. It was early in the hearing when Senator Richard Shelby, Republican of Alabama, said that Sessions’ record of “treating all Americans equally under the law is clear and well-documented,” Ariel Gold, the campaign director of Code Pink, said Wednesday. Fairooz said that, on hearing that, she let out a giggle. She said when officers came over, she expected to be warned or told to shush and was surprised to be taken into custody. Sessions’ nomination was contentious, as critics, pointing to past statements he had made, asserted, among other criticisms, that he was a racist. Gold, who was at the hearing, described the noise Fairooz made as a “reflexive gasp” that was no more loud than a cough. “I would barely call it a laugh,” she said. Fairooz said the noise was not intended to disrupt the hearing, which had formally been called to order. All three activists pleaded not guilty to the charges, rejecting a plea deal and demanding a trial.